It's coming up to two weeks since the fasting month started and I know all my lady friends who will be celebrating Raya (Eid Mubarak) soon are anticipating another spring cleaning before the big day arrives. I usually do my cleaning, shopping and decorating a week before the occasion. That way I can enjoy the last minute Raya discounts and I can keep my place looking nice nearer to the celebration instead of slaving away cleaning too soon! Thanks to my furry cats and the trails of fur balls they leave behind everywhere they go, we don't have many carpets or rugs at home. But we do have special-occasion rugs, which we roll out for guests when the occasion calls for one. The small rug we purchased for Raya last year was from IKEA and I love that it's white with lime green prints. We rolled it up and kept it away right after all the celebration, because you know how white rugs can get dirty really fast. So that one is still good to go for this year's celebration. Having said that, we always buy at least one new item for our home every Raya and I think a new rug wouldn't hurt. Besides, I also want to replace the one we have inside our bedroom. And with Raya around the corner, I now have a very good excuse to go rug shopping soon! 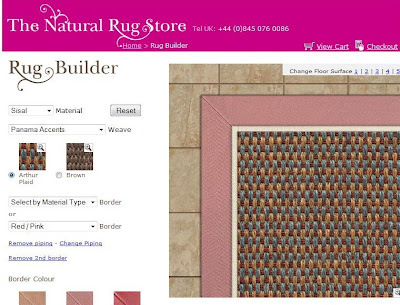 Why not check out The Natural Rug Store? Here, you can find custom made natural Wool Rugs and runners. 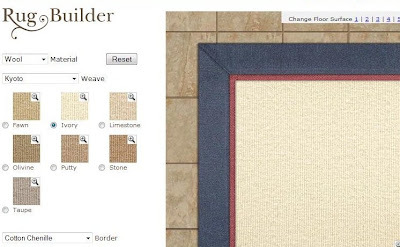 Enjoy access to hundreds of high-quality natural materials including sisal, wool and seagrass to create your unique natural rug with the Rug Builder. I had a lot of fun playing around with the rug builder to come up with my own designs! What do you think? Thanks to my lil kids, although they're not furry.. they make the place un-ruggable!! LOL! First chop too this month yay! U mean u going to “balik kampung obersea” is it Shemah??????? Wowie!!! Yeahh!! first chop!! LJ dah 4 chops!! OH NO!!! LOL! That's such a cool site!! To be able to customize your own rug!! Sometimes people buy rugs because they look pretty and when they reach home, it doesn't match the rest of the interior..
noooo lah!! My uncle's place kat Tawau je!! LOL! Not going obersea for a while yet... LOL!!! My kids are spillers.. they spill EVERYTHING!!! our last rug had to go for laundry and in the meantime, the floor is bare.. and everything is much easier this way.. just mop up their spills!! Yeah la LJ determined to win this month! Last month she lost to Monica by 1 chop only lol! hehe. karpet baru tuu best jugak. kalau masa bersih malam raya tuu buat guling2 guling tuu syiok sebab bau karpet baru sambil layan suasana malam raya. congrats shemah for being the first. those rugs look cool! i love rugs most especially when i just feel like lazing around the living room...nice and comfy! Hmm....I don't really like rugs though. Ha :D Maybe it is because...it is hard to maintain? aiyooo EC application server failed!!! Same here!! Some more I started dropping late now server down aiyoooooooo!